Our village has started a Scarecrow competition, with no theme and which anyone can take part in. So I decided to take part and make a male Hen Harrier to raise awareness of it's decline. I've been lucky enough to see Hen Harriers a few times, but maybe I won't in the future if something isn't done to halt this decline. Hen Harriers (and other raptors) have been illegally shot, killed by traps or poisoned and their habitat is being destroyed. This is happening all over the UK and some people believe it is linked to driven Grouse shooting. I don't want to use this blog post to blame anyone though, but I do want people to understand what a sad situation we are in with not a single pair of Hen Harriers breeding successfully in England last year. The Hen Harrier is protected so how can this be happening. The whole design started off as pieces of insulation board from my dad's work, which slowly turned into the finished design. A lot of hard hours were put into getting the right shape and colors, but to start with we (me and my dad) had to form the body structure and think about how we would attach wings and head. This picture here shows the cut away section ready for the head, and the body is starting to take shape. It was quite tricky carving and shaping the insulation board. At this point it was looking more like a Basking Shark. The head was formed from separate pieces of board stuck together and here you can also see the slot which was to take the wings. At this point it was know to everyone as the mutant budgie! A bit more carving and the head begins to take it's Hen Harrier form. This was the most difficult bit to carve to get it to look right and I had to keep checking my pictures to make sure I was still on track. Legs and feet - hollow plastic tube with electrical cable for the talons. Feathers - piece of old material. Of course I wanted the Hen Harrier to be ringed (you never know we might re-trap it one day) and know they are colour ringed with 3 letters and 3 numbers - mine are FIN ( that's me ) and 132 which is a memorable date for me. Here it is hovering above our porch roof held on by a sturdy piece of timber ( let's hope it doesn't get too windy, although I would sort of like to see it soaring over the village). A close up picture of the finished Hen Harrier showing our number for the scarecrow competition. If I am lucky enough to win, there is prize money, and I will be donating this to RSPB Skydancer. Well, there are lots of amazing people really trying to make a difference, and there are ways in which we can all help. Mark Avery is really doing a lot to raise awareness and make a difference. If you read through his blog you will learn lots about the decline of Hen Harriers in England. 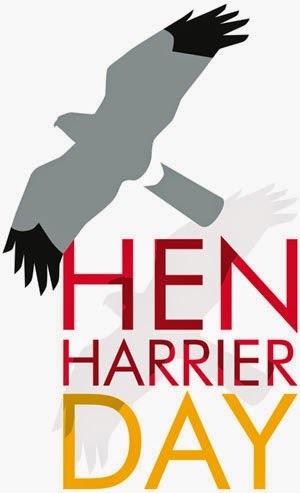 Mark is also organising a demonstration to raise awareness, so you could give up some time and attend Hen Harrier Day. You can sign Mark Avery's petition to ban driven Grouse shooting and help let the Hen Harrier numbers recover. You could also choose not to eat Grouse at home or in restaurants and even question the chefs on where their game comes from and if there are breeding Hen Harriers on the estate. You can vote for RSPB Skydancers to receive funding from the National Lottery so they can continue to help the Hen Harriers. You could even build a huge Hen Harrier and stick it on your roof, as this may soon be the only way many people will see one in England. Have you ever seen one? They are the sort of bird that is once seen never forgotten, but I don't want these stunning birds to become just distant memories. Excellent. Talons crossed that you win. I have seen plenty of Marsh Harrier, saw one Montague Harrier at Minsmere and only seen a Hen Harrier once at Salthouse, Norfolk I too hope it's not the only one. I hope people do go and sign Mark's petition, it doesn't take long and only one email to confirm your details so come on everyone please sign it. Great effort by all creating the scarecrow Findlay. That's an absolutely wonderful scarecrow, Findlay. A great bit of sculpture. You should be offering to show it in the Art Marquee at Birdfair! I hope that you win the competition - your entry will take some beating! Findlay, well done to you and all your family. Like Richard said, a great bit of sculpture; and it would be excellent if it went on show at Birdfair. Good to see the Extinction Symbol there too. Hope it becomes universally recognised. Great idea for a scarecrow. Brilliant, Findlay! I'll be tweeting this blog post to raise more awareness and I hope that you are successful in the competition.. Hen Harriers need all the help they can get and England will be much the poorer if they are allowed to disappear. Very impressive Findlay. If your Hen Harrier doesn't win, I'll be demanding an inquiry! Full marks for bringing this bird's plight to peoples attention. If you don't mind, I'd like to post your blog onto my Facebook page. I don't mind at all, the more people that know what is happening the better. Thank you. See hen harriers about 20 miles away from my house every winter, they roost at a place called wicken fen in winter, but I'd love to see one in breeding season, I want to go to birsay moors or cottarscarth in Scotland as there are some breeding there. Excellent work, keep it up, we need boys and girls like yourself to show these outdated dinosaur Raptor killers that our young people are not willing to tolerate their illegal activities any more! I've been involved with birds of prey for more than 45 years, in that time I've seen raptor persecution and habitat destruction reach an all time high. If something isn't done soon to put a stop to it then I'm afraid it will be too late for many youngsters who are growing up today to ever see these spectacular birds. Well done, Findlay, (and your dad and mum). I hope you win. That's a fantastic sculpture Findlay... really well done. Well done, Findlay. You've set a tremendous example. Hen Harriers deserve support from everyone and your effort certainly can't be ignored. Impressive!! Top man! You gotta win or there's no justice! What a wonderful idea to highlight the plight of the Hen. Harrier but making this fanatic scarecrow. I have signed the petition. COME ON BLOGGERS, DO YOU WANT THES BEAUTIFUL BIRDS LOST FOR EVER? please SIGN. Well done ; inlay, you certainly have grown up since I last saw you. We have a scarecrow competition in our village too. No one thought to do a Hen Harrier either and it was a simply brilliant idea of yours. I think yours is a winner, and maybe it will scare of those people who want to harm OUR Hen Harriers in North West England. You did a great job with the scarecrow. I hope you win. Cool, I love the scarecrow "harrier". It is sad the Harrier are being illegally hunted. I hope it can be stopped. Great post! That's amazing Findlay! You've done a super job, I'd say that's a winner! The world ... and birds ... need more activists like you! What a shame that the hen harrier is apparently being hunted (illegally). (I hate bird hunting anyway.) Good luck on the contest and especially of course to you and the others working to save this bird! Aren't you clever! I love your scarecrow. You did an amazing job! I also like your information of keeping the Hen Harrier from becoming extinct. We all need pitch in where we can to help protect birds and animals in danger. You are doing so much with your information...getting the word out! Good job! What a great project! I love your sculpture. Brilliant Job Findley, so impressed. Lets hope the the madness stops soon. You are a "top bloke" Findley for the awareness you are trying to create regarding the Harriers, I hope you win the competition. Great idea! I think it will terrify the crows rather than just scare them! Ask you mum to check her Facebook messages. Sorry for slow reply - hectic weeks! An eye for a moth!